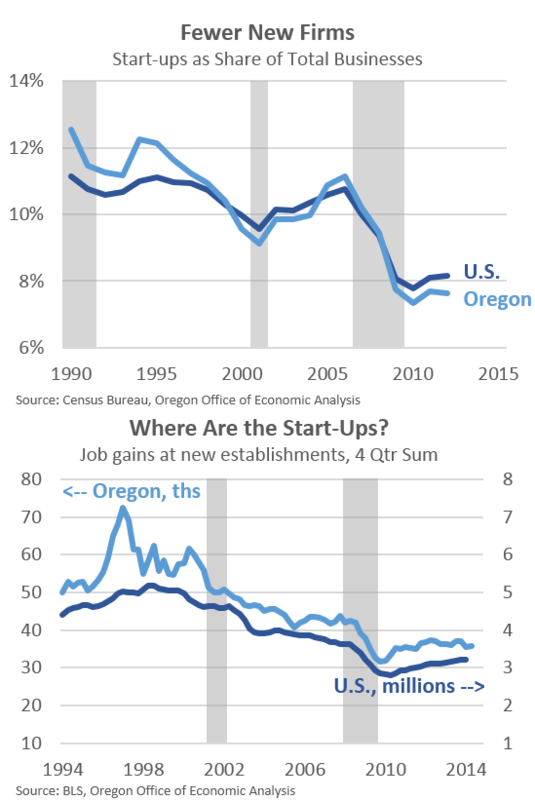 While the plethora of new high-technology firms draws the media headlines, you may or may not know that entrepreneurship overall and start-ups in both Oregon and nationwide have been declining for a long time. The Great Recession exacerbated these trends, which have yet to rebound so far in recovery. Researchers have been trying to tackle the reasons for these changes in the past decade and have yet to reach a definitive consensus. This is a big topic with many facets and tangents to explore. What follows is an initial, wide ranging look from an Oregon perspective. Scroll through the slides at the end for a more complete look. One area of potential concern that may impact longer term economic growth is that of new business formation. Over the past eighteen months, the number of new business license applications with the Oregon Secretary of State have begun to grow again. However, these applications remain low relative to historical standards. Similar trends are seen in data available from the U.S. Census Bureau and Bureau of Labor Statistics. These indicators of entrepreneurship and business formation all show that the recessionary declines are over, but that not much progress has been made in terms of regaining lost ground. 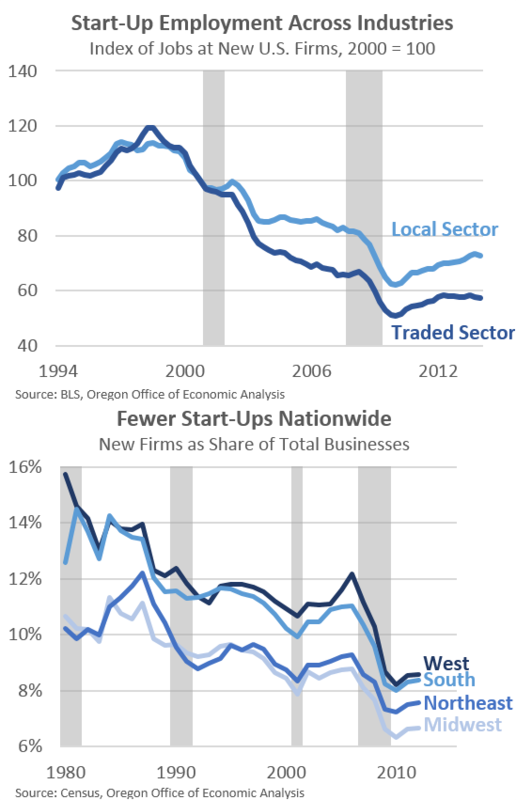 As such, the share of all businesses that are start-ups, either in Oregon or across the nation, is effectively at an all-time low, with data starting in the late 1970s. Associated start-up employment follows a similar pattern. The concern is that new businesses are generally considered the source of innovation for new ideas, products and services that help propel economic growth. As the University of Maryland’s John Haltwinger writes, “new and young firms play an outsized role in this productivity-enhancing dynamic process, and in net job creation.” These new firms grow and replace older, less-competitive firms. To the extent that lower start-up rates indicates that R&D more broadly is not being undertaken, slower growth is to be expected moving forward. However, if the larger firms that have won out in today’s marketplace are investing in R&D and making those innovations themselves, then the worries about the number of start-ups today is overstated. It can be hard to say which is the correct view. Another possibility is that today’s large firms are retaining these new innovations in-house and not spinning-off new firms. For example, look at the famous Silicon Forest Universe map of Oregon high-tech. Tektronix has a larger number of spin-offs than does Intel and not because Intel only has a few — they have a lot. However, it is possible in decades past that the large, established firm would simply spin-off the new idea into a new firm, whereas today the firm retains the innovation in-house. If this is the case, then the longer-run declines in start-ups is probably less of a concern. However seeing these longer run, downward trends in new business formation warrants, at the very least, concern about future growth prospects. It is important to point out that these trends are not an Oregon specific issue, the declines truly are nationwide and in each industry. Even high-tech. Some of the reasons given for the decline range from technological change and demographics to student loan debt and health insurance-related job lock, not to mention increased regulation and policy uncertainty. However, as of now, no clear explanation has emerged in the research to fully explain these trends. Individually, each of these possible reasons only explains a small amount of the decline over time. On the bright side, other indicators of business activity are holding steady both nationally and here in Oregon. Total R&D spending in the U.S., measured as a share of the overall economy, has been fairly constant in recent decades. As the federal government has pulled back in R&D, private businesses have increased, keeping the total expenditures around 2.5 to 3 percent of GDP. Similarly, while start-ups as a share of the economy is down, the absolute number, or level, of start-ups is holding constant. These firms are also seeing steady amounts of venture capital funding in the past decade, after adjusting for inflation. Furthermore, Oregon business’ gross operating surplus (or capital income) as measured as a share of the economy is holding steady. There does not appear to be an overall erosion in these broader indicators of business activity. Lastly, one of the reasons start-ups matter is that it is generally easier and arguably better to foster new businesses than recruit new firms to relocate to your area. Not that fostering and growing businesses is easy — it’s clearly not. Rather, relocation of big, successful businesses is hard to do. Why would the firm want to move from their location if they’re already successful? Yes, there are reasons (expansions, workforce, incentives, etc.) but there are certainly downside risks as well. Furthermore, local businesses and start-ups also source their business needs locally as well. They may use the law firm down the street and the advertising company in the adjacent town, and the like. Additionally, as these start-ups grow, they need to build their workforce and fill a wide range of occupations from office workers and sales staff to engineers and managers. Headquarter operations in particular demand a wide range of services and workers across many industries and skill levels. Businesses rely upon other firms’ demand for sales and services, and the accumulation of this results in what economists call agglomeration effects, which helps drive innovation and economic growth further. However headquarter operations do not materialize overnight and at one point each was a fledgling start-up. Overall the decline in start-ups, employment and new business formation as a share of the economy warrants at least continued monitoring. To date the consensus of economists appears to be something along the lines of: “These trends look worrisome.” The reason being that new firms are generally considered the source of innovation and new products and services. However research has yet to fully explain the reasons for the decline and broader measures of business activity have not similarly eroded. To the extent that today’s big firms are still strong sources of innovation, and potentially retaining these new ideas in-house, then the decline in start-ups nationwide is much less of a concern. For more information on these general trends nationwide, see recent work from the Federal Reserve Bank of San Francisco, Ben Casselman at FiveThirtyEight, and Dietz Vollrath’s summary of recent academic research. Unfortunately I cannot take credit for this great observation. That goes to former state economist and current Portland State professor/Northwest Economic Research Center head Tom Potiowsky. Super article – thank you Josh! Clayton Christensen’s work would seem to argue that new companies are a necessary mechanism for bringing certain classes of innovations to market – and against larger companies actually deploying them.even if created by them. 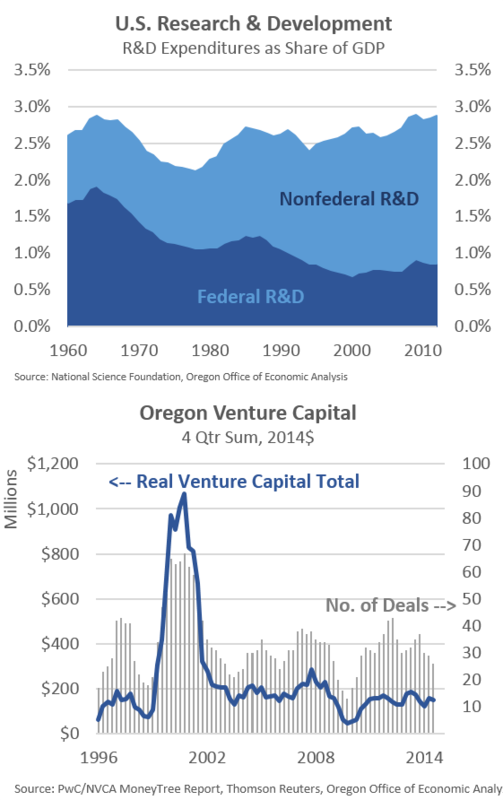 If one takes that as a possibility, then given the nature of Oregon’s tech sector does diminishing start-up activity potentially affect the health of the Oregon economy more than in other parts of the country? Thanks Patrick for the comment. Sorry for the delayed response. In some respects, yes, of course. However my biggest concern is that while the software side of tech is growing quickly, our historical reliance has been on the hardware manufacturing side. This side is more susceptible to global forces and technological change when it comes to jobs than is the software side. I think. But from an innovation perspective, at the end of the day we don’t really care about where it comes from, provided it does come to market and fills a void/propels economic growth. Big and small businesses alike have pros and cons in terms of both making products and delivering them to market.